One reason South Sea settings paled next to jungle ones was lack of a danger element. Sharks and snakes were compliant toward eating natives or disposing of villainy, but there weren't lions or gorillas in the tropics, and much as romance beckoned among palms, lingering taboo forbade native and white coupling to anything other than a bad end. The Tarzans got round barriers for the ape man being after all white, merely raised amidst savagery. Trader Horn indicated patron preference for Africa over islands in any case. Tarzan merely settled the contest in that cotenant's favor. For a meantime, there'd be half-bred Untamed to mix-master formulas that had worked before. Joan Crawford was a below-equator wild child, her parentage sufficiently Caucasian to enable a love-match with Robert Montgomery. Untamed had it all ways by letting "Bingo" be raised to tropic rhythm, a down-there Dancing Daughter no more delinquent than ones stateside. 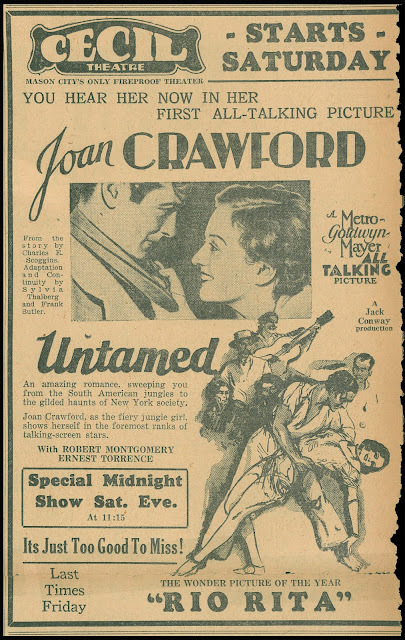 Untamed was Crawford's first talking vehicle, not one she'd relish referring later, I'd guess, but for its time, a cunning distillation of what her public wanted to watch JC doing. 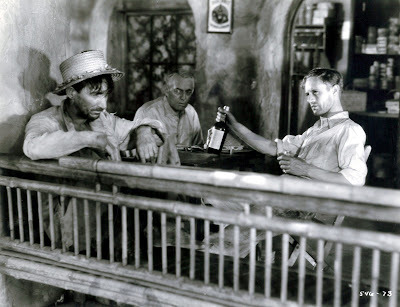 MGM, like all entertainment manufacturers, made what would appeal there and then. Chances are an Untamed would not have worked six months earlier or later. Like most of the Crawfords, or any star's work, it is ephemeral, but in that happy way vintage pics have of evoking their day to near a point of taking you there. Stories would be bent, broken if necessary, to accommodate restless viewing. Untamed sheds tropic locale when we've had enough of it, and civilizes "Bingo" no later than we're ready for her to again be Joan Crawford of flapper mode. Exotic setting had become background on back lots, as would be the case with Tarzans to come. W.S. Van Dyke came back to the subject, this time to depict paradise in realist terms he experienced during the White Shadows In The South Seas shoot. Never The Twain Shall Meet saw whiter-than-white Leslie Howard going native to ultimate sorrow and near-destitution. His was a hard lesson for succumbing to half-caste charms of Conchita Montenegro, the actress of Spanish extraction, but credible enough sarong-clad. She's presented too as having derived from a white father, the latter briefly on hand to convey custody before collapsing of leprosy. It's understood nothing good comes of surrender to primitives, romantically or otherwise. Howard is seduced, chucks his fiancée, and repairs to dissipation beyond civilization's reach. Writing/direction makes no bones as to folly of this. The leading man's descent here is a steepest since Emil Jannings kicked over traces for The Blue Angel's Lola Lola. A review of Van Dyke's White Shadows journal explains how Never The Twain got its hard line. 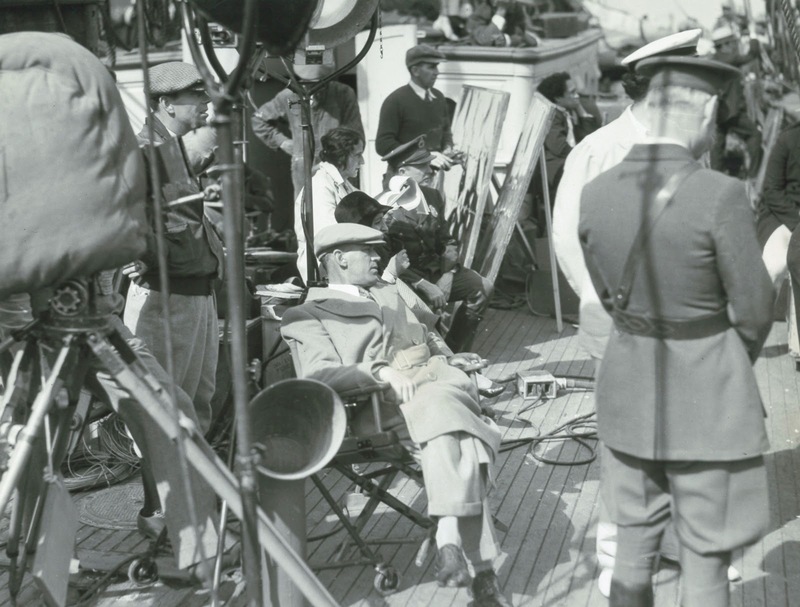 The director was a veteran of months under a tropic sun, having gone twice now to film in what he knew was fraudulent paradise. Van learned that by the late 20's, civilization had more than ruined what penny postcards had promised us. Maybe that explained two-edge swords that were all of Metro's South Sea ventures. Hollywood could lie only so far. Glamour-dusting the islands would come soon enough --- but not yet. As with previous trips, Never The Twain Shall Meet did nothing to boost tourism, even if these sites had been more accessible then. Metro was free to scorch tropic earth partly because there were no official entities to complain about it, unlike countries/territories more vigilant and, thanks to their allowing in Metro product, having sharper teeth with which to defend national honor. As with Untamed, Never The Twain Shall Meet is partly one formula, mostly another. A first half is Mayfair drawing room-set, hidebound denizens off-put by Conchita's discard of inhibition. 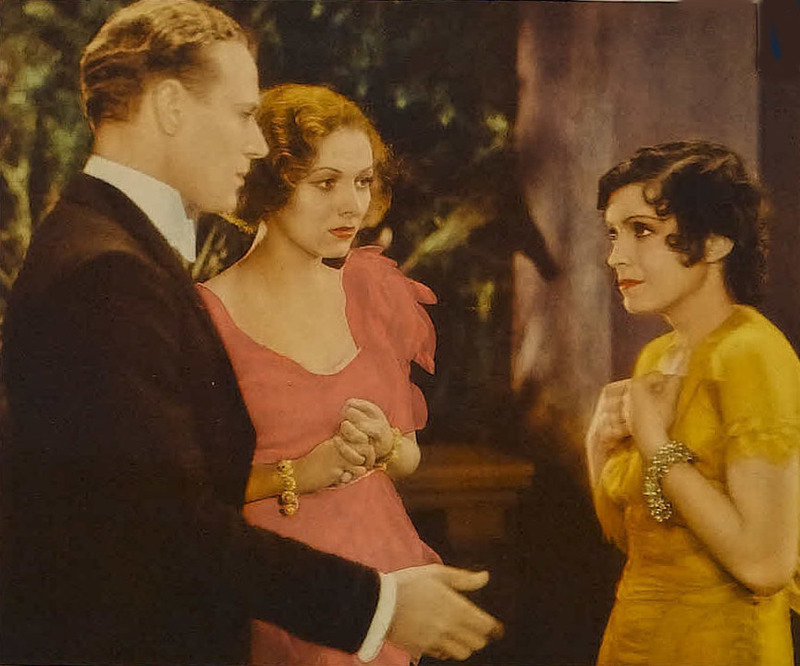 Sort of a Tarzan play in reverse, here it's Leslie Howard giving over to base instincts his adopted savage arouses, the thing made censor-palatable by Conchita Montenegro's demonstrably Latin rather than darker origin. Miscegenation was a tight rope to walk in 1931, and well afterward for that matter. Forbidden fruit could be served so long as pretend aspects were unmistakable. Imagine Hallelujah's Nina Mae McKinney cast as Leslie Howard's opposite number here. 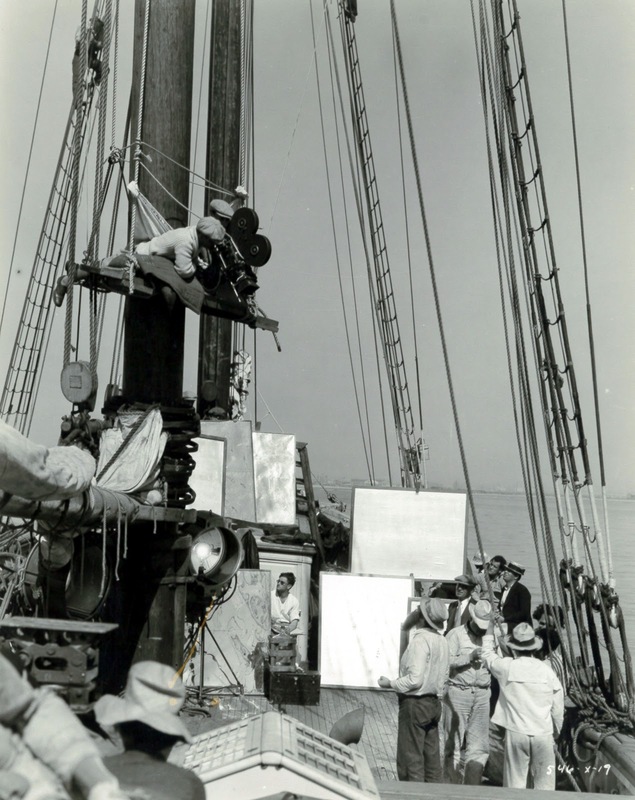 She was under a five-year MGM contract, and based on an energetic Hallelujah performance, might have lit up Twain considerably, though her casting would be, under then-conditions, unthinkable. South sea backdrops were too attractive for Hollywood not to tame. So long as fantasy governed, uncharted isles could be profit centers. 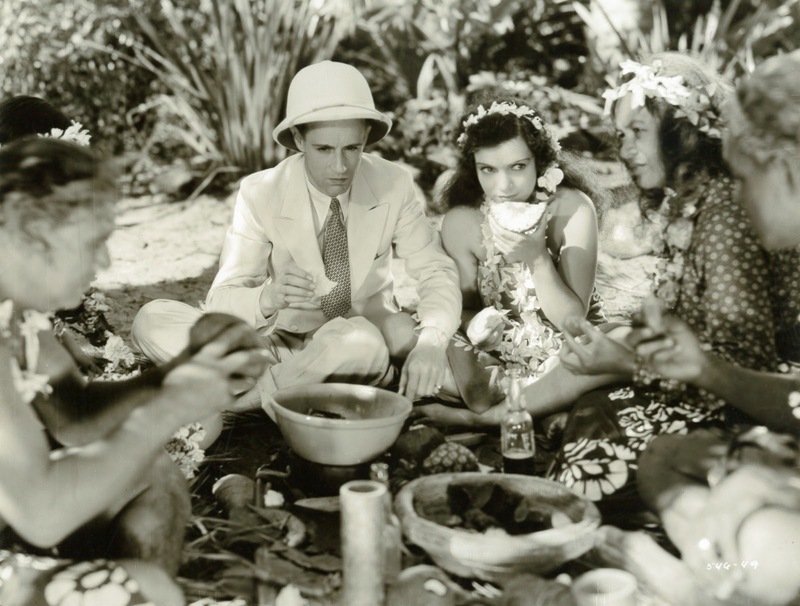 Mixed-caste romance sustained so long as it was doomed, as was case for Joel McCrea and Dolores Del Rio in 1932's Bird Of Paradise. White perfidy among natives took a back seat to romance and rescues. They'd even spike atolls with prehistoric life to jazz up King Kong. 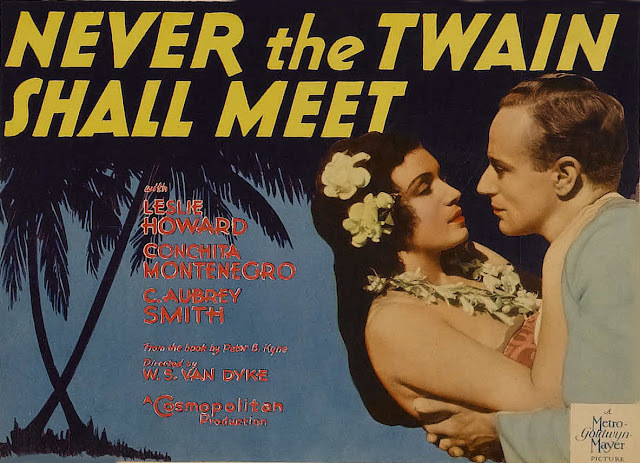 Sleazy tropic aspects were exploited by Warners for Safe In Hell before Paramount calibrated precisely what worked best on South Sea setting, to wit Technicolor, typhoons, and Dorothy Lamour as safe-date for city-bred interlopers. By wartime a reliable genre with rules in place, South Sea exotica, or better put, escape, reached a summit with Son Of Fury, its sarong-clad Gene Tierney definitely white --- but who was monitoring by this time? --- these things were so other-worldly as to be near-cartoons. White shadows were now cast by mass audiences at last fully comfortable with island themes and formulae. 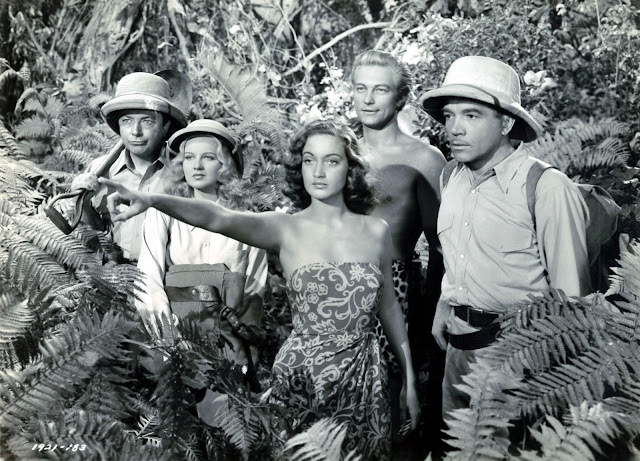 Unless I'm mistaken John, the group-shot photo which has a bare-chested Richard Denning standing in back is from Paramount's "Beyond The Blue Horizon" and film which (along with "Aloma Of The South Seas") hasn't been seen anywhere for DECADES and which I would dearly love to see again. I assume that Universal now holds the rights to it.......? Right, Brad. The only time I ever saw "Aloma" was when Ronald Haver played it at the LA County Museum in a 35mm nitrate print, and that was spectacular. Trying to think of a way to make "Cobra Woman" fit this discussion. In that one, white boy and respectable mission-schooled islander could be happily wed without controversy. There was some in-law trouble, but that was it. Everybody with a speaking part -- good guys, bad guys, incompetent guards -- was insanely white (aside from India-born Sabu, playing a little Polynesian boy just before going into the real-life military), and the title character's attendants were mainland starlets. But they took pains to gather plausibly dark-skinned extras for crowd scenes, calling attention to the fantasy casting. Of course, it's possible to overanalyze a movie where the villainess selects human sacrifices while doing a nightclub act. 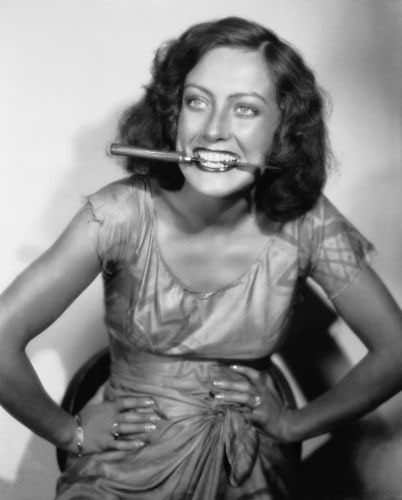 Just when I thought that Joan Crawford couldn't get any scarier, you show me a photo of her with a dagger clenched between her glistening fangs... What's next for Halloween? Judy Garland in I COULD GO ON SINGING?